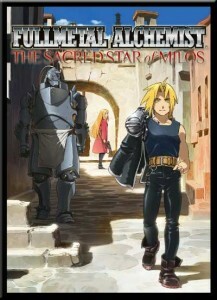 Otakon 2011, an otaku generation fan convention in Maryland, will be hosting the world premier of the subtitled version of the anime movie Fullmetal Alchemist: The Sacred Star of Milos. This just weeks after the film’s theatrical release in Japan. The exclusive premier will be presented by Otakon and FUNimation© Entertainment. PLUS Director Kazya Murata, who is the Otakon Guest of Honor for 2011, will be attending the screening with a Q&A panel afterwards. Mr. Murata is known for his work on titles like Gunsmith Cats, Steel Angel Kurumi, Eureka Seven, Code Geass: Lelouch of the Rebellion, and many others. In the lost holy land of Milos, the Elrics search for the truth behind an unknown form of alchemy. What secrets are hidden in Milos? Before Ed and Al can find the truth. Otakon is an anime and manga convention hosted by and for fans, what the organizers call “the otaku genreation”. Their 2011 event will be held July 29-31 at the Baltimore Convention Center which is, coincidentally, in Baltimore (Maryland). Pre-registration is currently open, but will close at 11:59 on July 16. Tickets are $75 for the full convention, no single day passes will be sold.